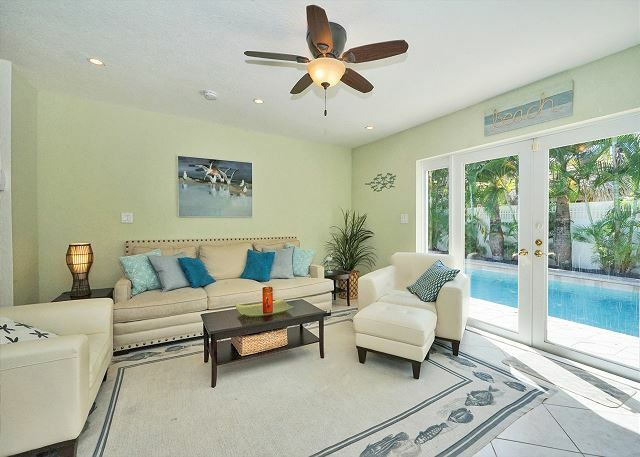 Splash in the fenced in heated pool or relax in the hot tub after a day at the nearby beach. 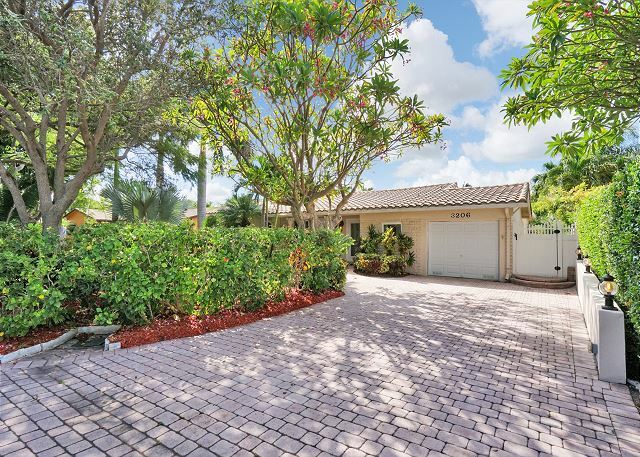 The driveway pavers are welcome site upon arrival to your vacation rental. 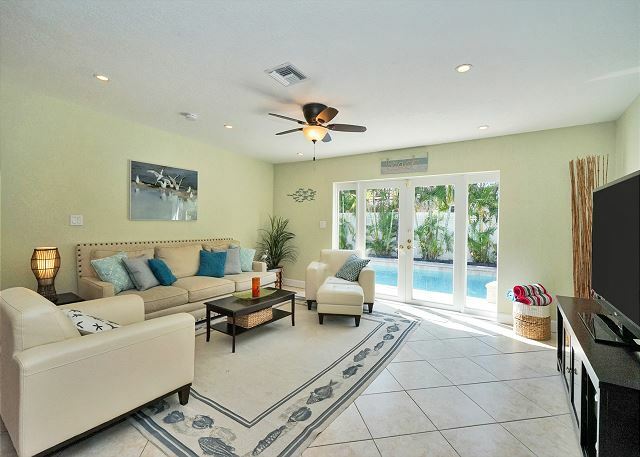 Large pool and hot tub is decorated with elegant planters and fenced in for privacy. 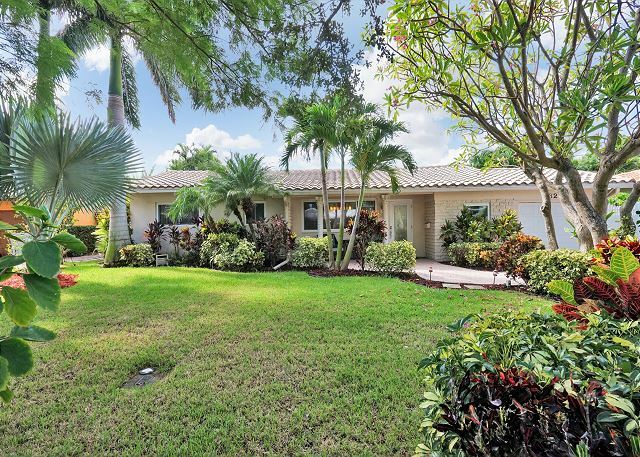 Lush tropical landscaping adds color to this vacation rental. The living room is decorated with pretty blues and greens that give you that happy tropical feeling. The glass doors overlook the pool and allows you to enjoy the outdoors while sitting inside. 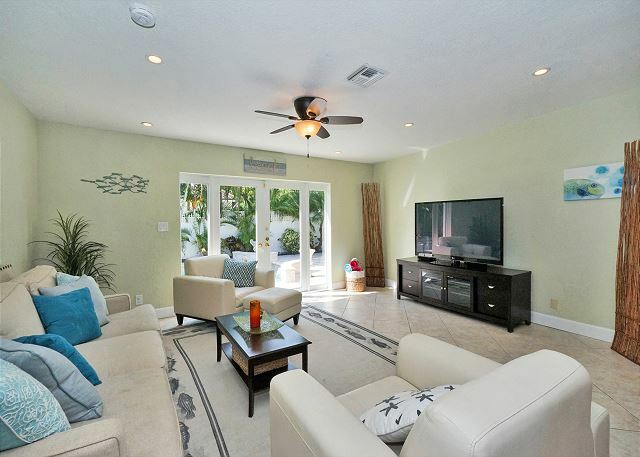 The living room is large and allows the whole family to enjoy movie night on the oversize TV screen. The glass doors allow you to enjoy the outdoor landscaping. 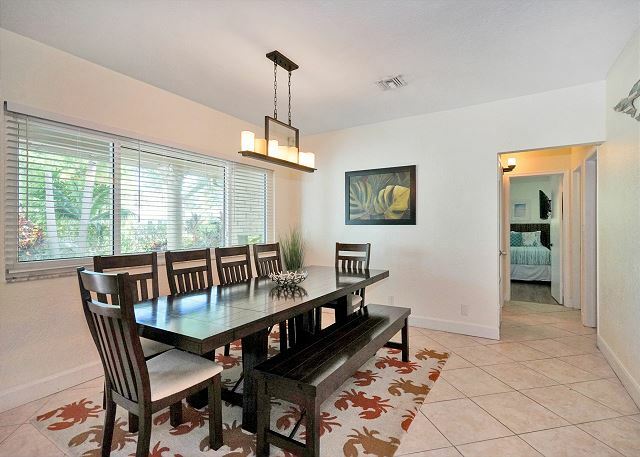 Enjoy the informal dining area for casual meals. 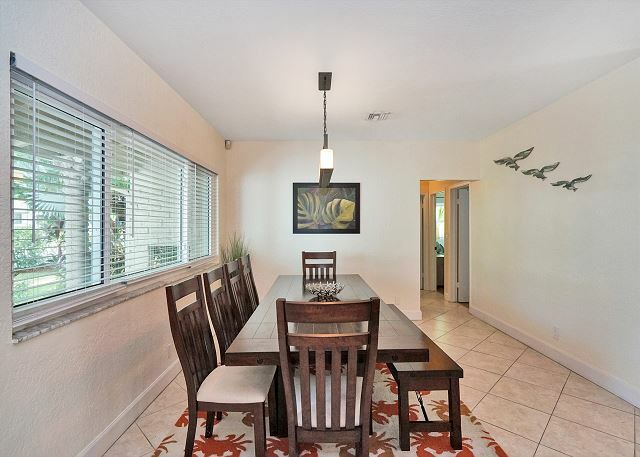 Have a quick breakfast or lunch at the casual dining area. 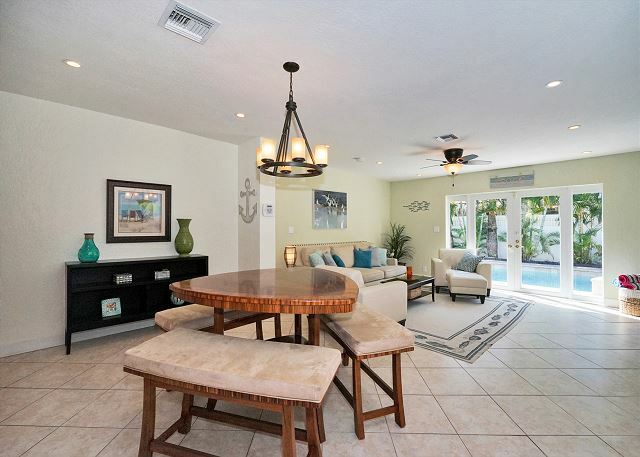 Sit for appetizers before dinner at the informal seating area. When hosting larger groups, the formal dining area is perfect for elegant dining. The dining area is private and sophisticated and can host up to eight people. 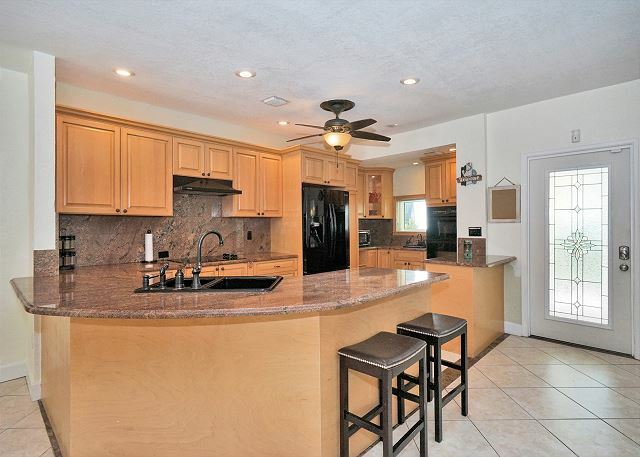 The large open kitchen and dining areas provide plenty of space for entertaining. The eat-in kitchen is convenient for guests that are on the run. The breakfast counter allows for two people to enjoy their early morning breakfasts. 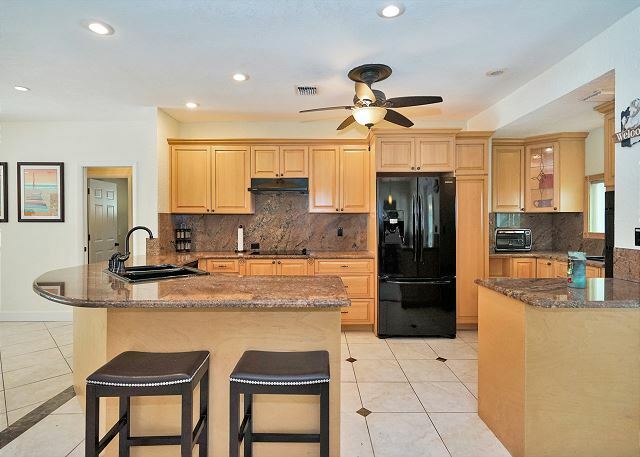 The solid wood kitchen cabinets are attractive along with the granite counter tops. 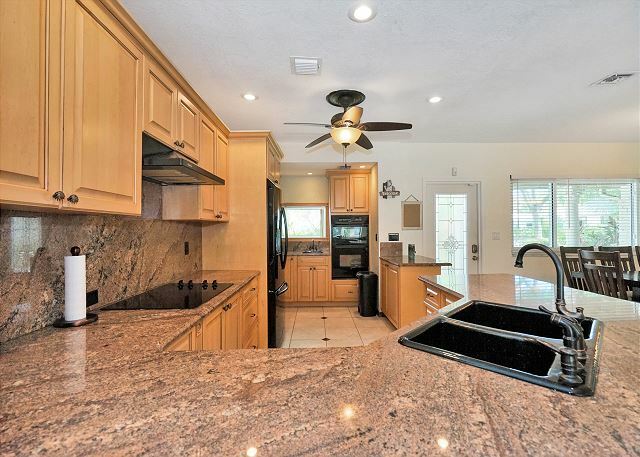 The imported granite counter tops are elegant and wrap around the double kitchen sink. Elegant white french doors lead you into the oversize master suite. 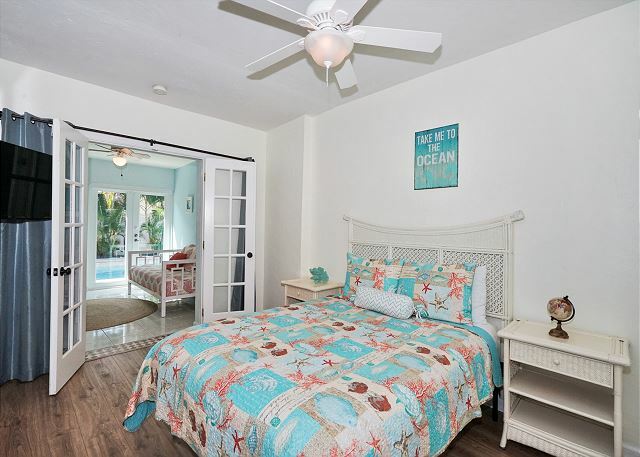 The master bedroom is large and decorated in blue hues to simulate the sky and the ocean. 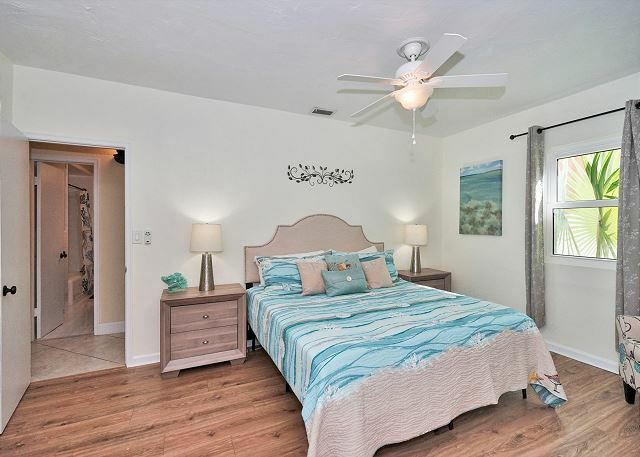 The master bedroom is cheerful yet elegant with wood floors and TV mounted for watching your favorite shows. The elegant glass french doors are a perfect entry point to the master en-suite bathroom. 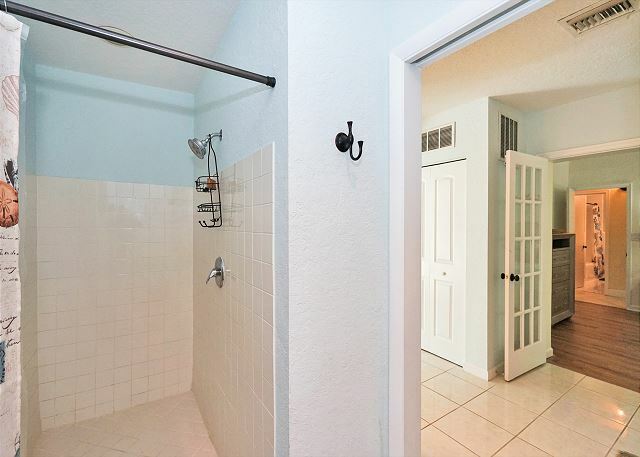 Take a cool shower after spending the day tanning under the hot Florida sun. 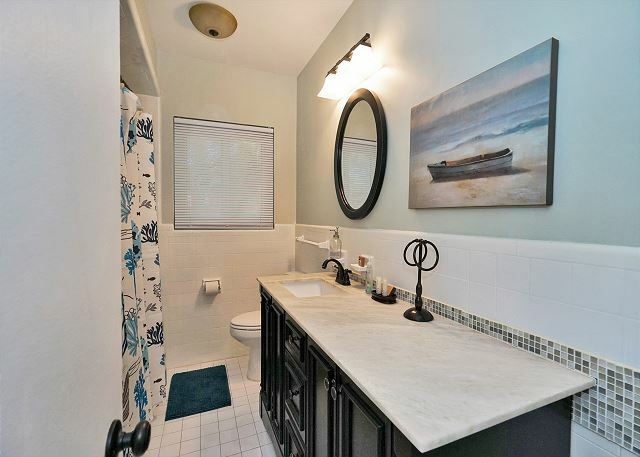 Enjoy the his and hers sink when showering in the master en-suite bathroom. 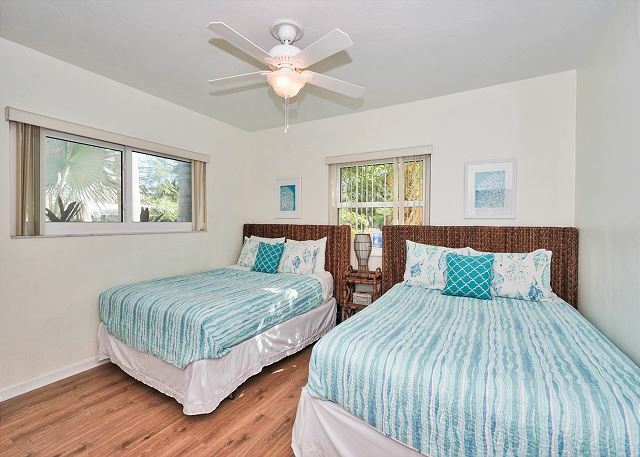 Stay cool with the ceiling fan over the two twin beds. The second guest suite sleeps two people comfortably in the twin beds. 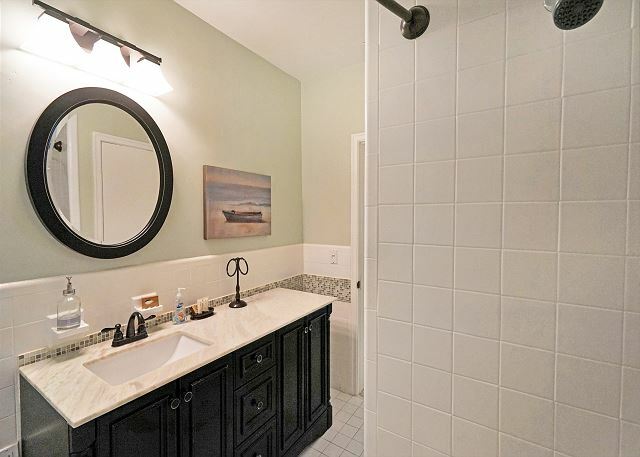 Fine finishes and fixtrues adorn the second bathroom when bathing. 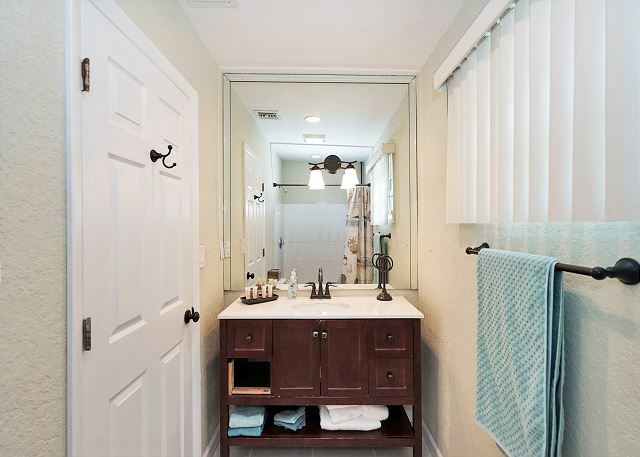 The elegant wood cabinets and counter tops are perfect for refreshing baths at night. 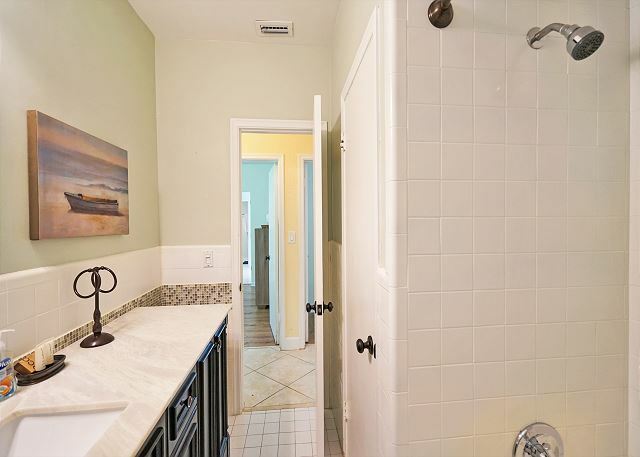 The second bathroom is perfect for either showers or baths after a day collecting shells at the beach. The TV is conveniently mounted for easy viewing when watching your late night movies. The third guest bedroom is beautifully designed with an en-suite bathroom. The third en-suite bathroom has a large shower and fine fixtures and finishes. 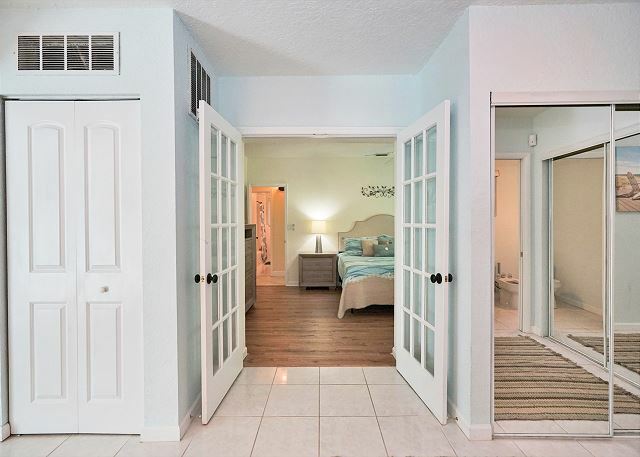 Pretty french doors lead into the fourth guest bedroom suite. The fourth guest suite is large with imported floors and mirrors for reflection. The daybed in the fifth guest suite is comfortable with elegant french doors. 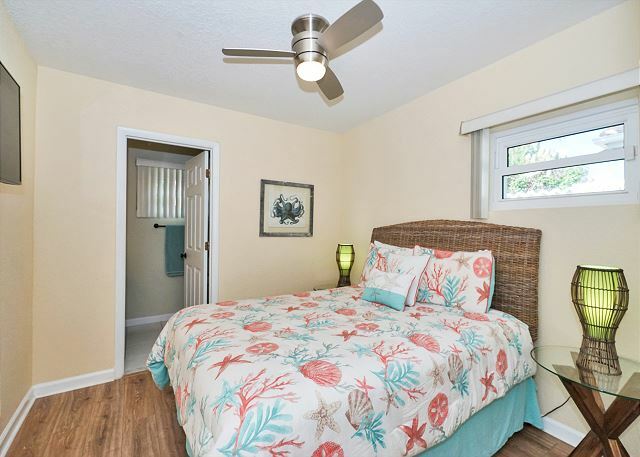 The fifth guest bedroom offers a comfortable day bed that sleeps one. 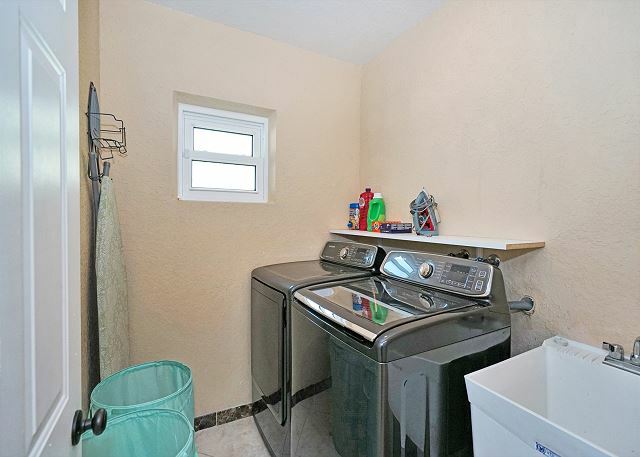 Top-of-the-line washer and dryer are convenient when washing your clothes during your vacation. There is plenty of room for two vehicles in front of the garage area. 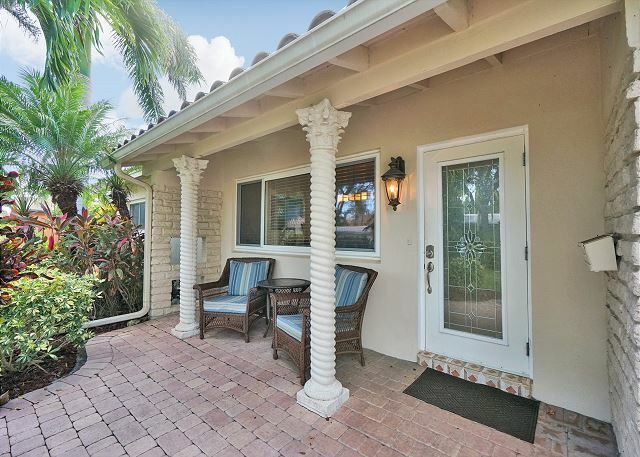 The front porch allows you to relax in the wicker chairs and take in the beautiful landscaping. 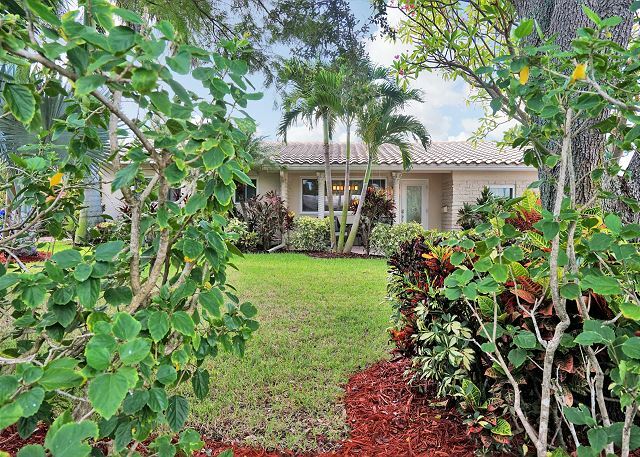 Florida native plants accent the front of the vacation rental. 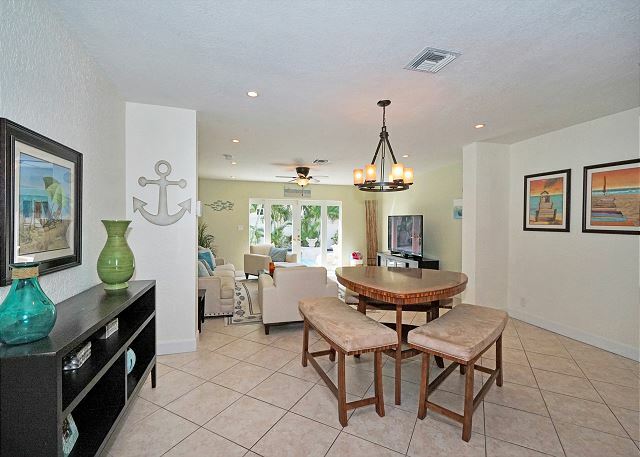 Enjoy your appetizers before dinner in the cozy Florida Room overlooking the pool. Sip your tropical drinks in the large Florida Room overlooking the green Florida foliage..
Eat under the stars or the umbrella in the al fresco table for six. Work on your tan while relaxing in the chaise loungers. Soak in the heated hot tub and then do your laps in the oversize pool. 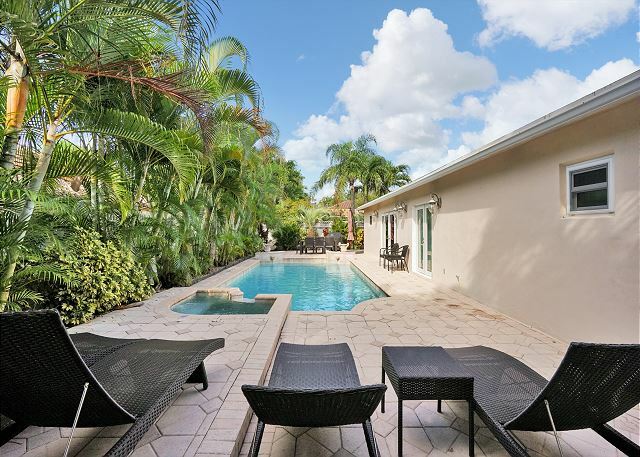 The private heated pool and hot tub is lushly landscaped with tropical palms. Melt your cares away in the hot tub at the end of the day. 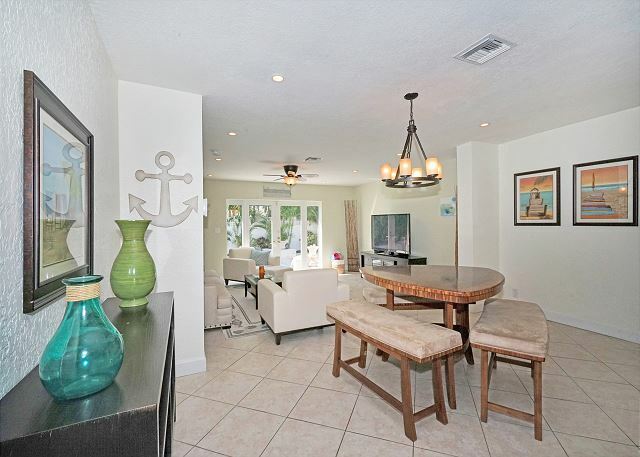 Watch the luxury yachts sail by on the Intracoastal Waterway or stroll along the beach. Take a leisurely afternoon bike ride to a nearby restaurant for happy hour. 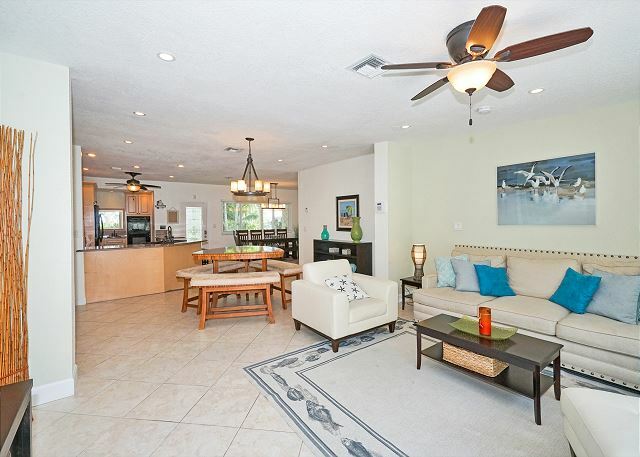 The beautifully designed open and airy layout makes it easy for your group to spread out while enjoying time together. With a 72” cable flat screen TV, a plush sofa, and leather chairs, the modern living room invites you to sit back and relax. 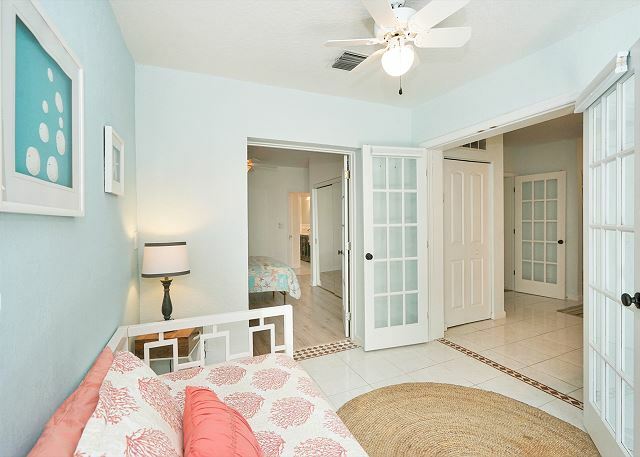 Open up the French doors and let the coastal breeze put you at ease. 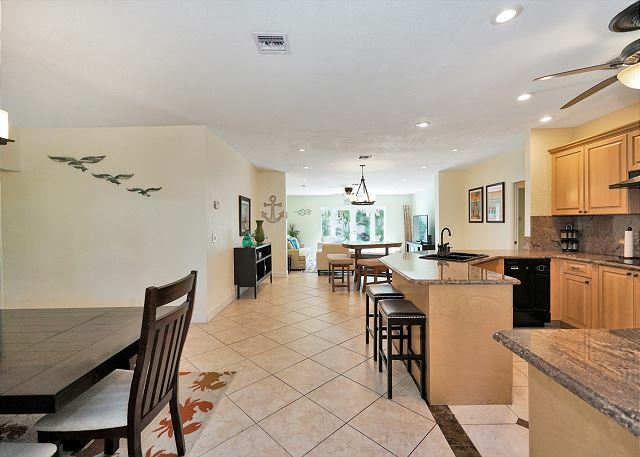 Enjoy a formal meal together around the sleek, wooden dining table with seating for eight, or eat casually at the granite kitchen bar top with stools for four. 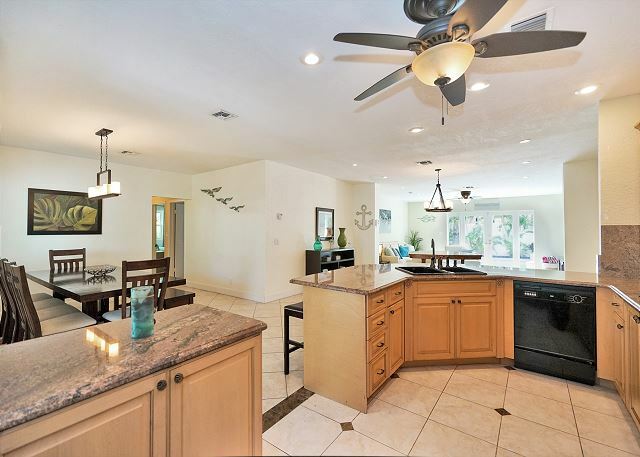 While a few of you enjoy appetizers around the center accent table with benches for four, multiple chefs can start dinner in the spacious, open kitchen. With a double oven, both the main dish and desert can be cooked simultaneously, and clean up is quick with two sinks, a ceramic stove top, and a dishwasher. 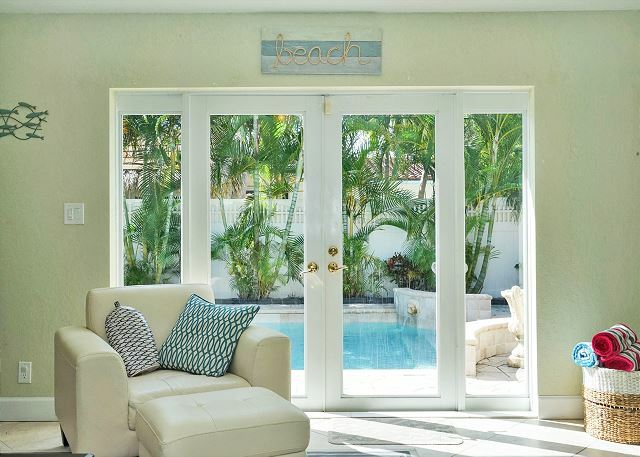 Up to 10 guests will sleep comfortably at this single-level beach home. 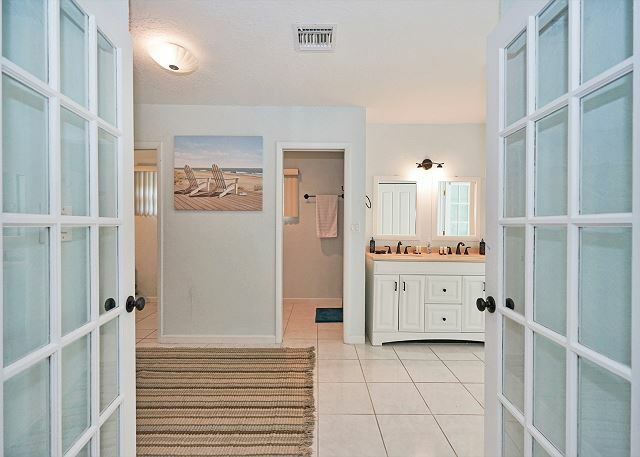 Down the hall is the master suite with a king-size bed, reading chair, and French doors leading to an expansive en-suite bathroom with a dual vanity, dressing room, bidet, and walk-in shower. 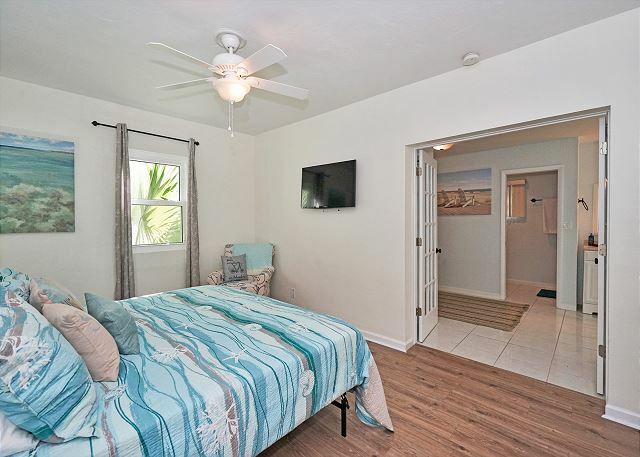 Off the master bath is a second living space that’s perfect for some quiet alone time, with a 22” flat screen TV, twin-size daybed, and access to the pool. 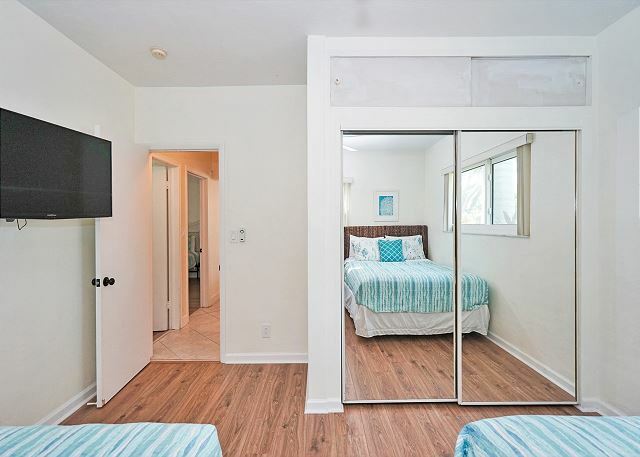 Through French doors to the left is the second bedroom with a full-size bed. 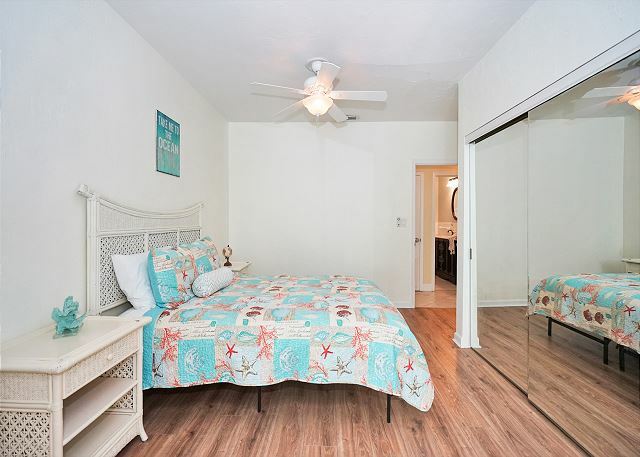 The third bedroom next to it includes two Queen-size beds and shares a bathroom with the second bedroom. The fourth bedroom at the opposite end of the hall boasts a queen-size bed, en-suite bath, and walk-in shower. 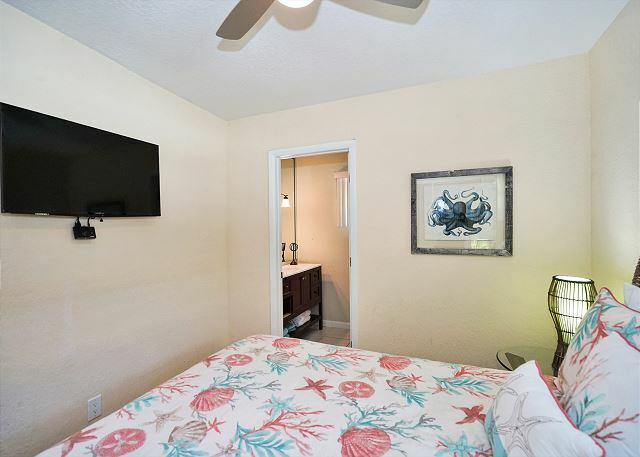 All bedrooms include their own flat screen TVs. Make the most of sunny days and grill out on the pool deck, with patio seating for eight surrounded by lush landscaping. Enjoy cold drinks from a lounge chair, take a dip in the refreshing pool with Roman steps, and fully unwind in the private hot tub. 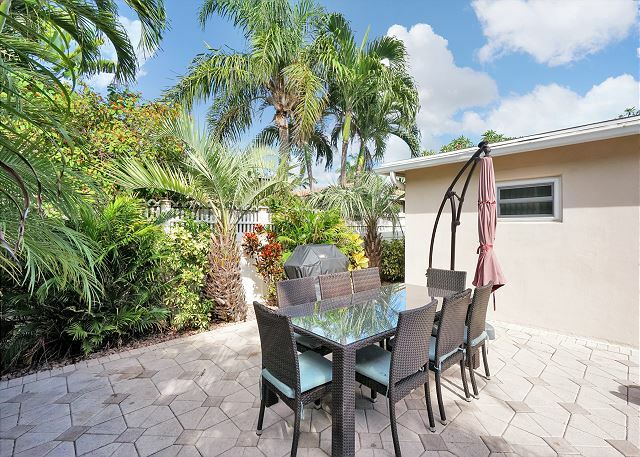 Known as “the Heart of the Gold Coast,” Pompano Beach is famous for its fantastic fishing, boating, beaches, and local parks. 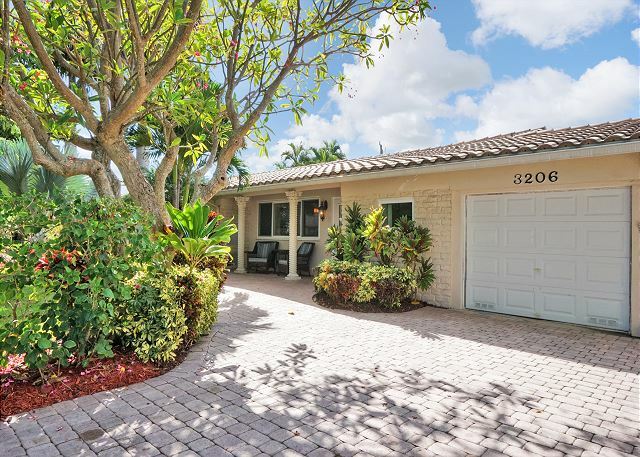 Head just 2.5 miles down to the Pompano Amphitheater for live music in an open-air setting, or set a tee time for one of the many golf courses within a 10-mile stretch from your rental. 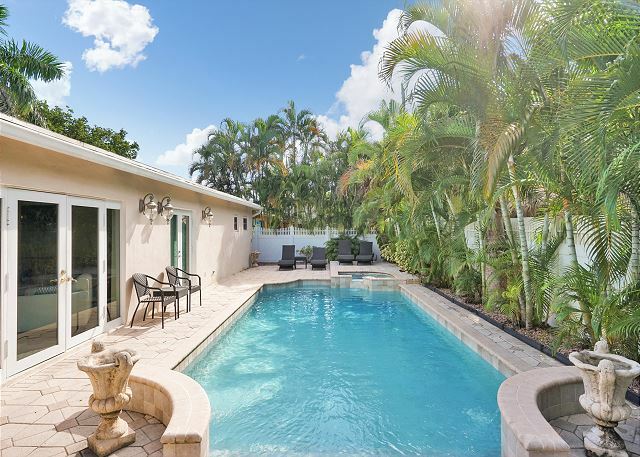 You’ll also be just a 15- to 30-minute drive from outdoor fun at Deerfield Beach, and luxury shopping, fine dining, and vibrant nightlife in Las Olas or Boca Raton. As world travelers ourselves, we know what matters most—exceptional customer service, beautiful properties, and authentic experiences at a good value. 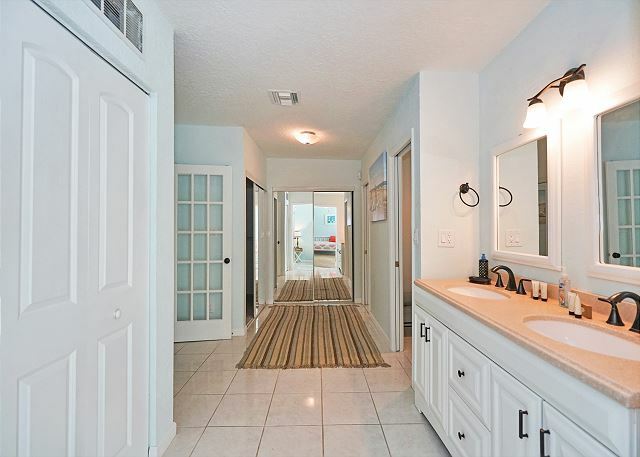 We seek out the best privately owned houses and condos that feature comfort and appeal, and treat them as our own. This rental was perfect. The house was as advertised and more. It was very clean and had everything we needed. The beds were comfortable and we felt like we were “home.” The outdoor patio and pool area were perfect including the hot tub. We had a great week and the host was very welcoming and quick to respond to any questions or concerns we had. We would highly recommend this house without reservation. It was an amazing experience. We all had an amazing time at your rental house. Everything was so clean and we had everything we needed. We couldn’t have asked for a better experience. Thank you so much!